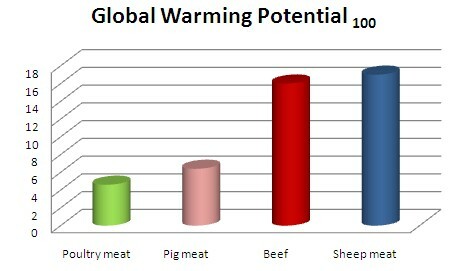 Chicken meat has the lowest environmental footprint of any meat. This is to a large extent due to the fact that chickens are highly efficient converters of feed into meat. There have been numerous studies that have confirmed this. One major study conducted in the UK and funded by the Department of Food Environment and Rural Affairs (DEFRA), compared the environmental burdens and resources used in production of beef, sheep meat, pig meat, poultry meat, eggs and milk. 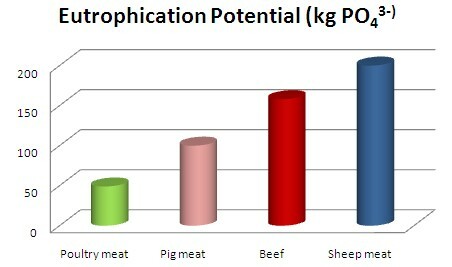 The Cranfield University study found that poultry meat production, in particular conventionally produced chicken (which represents the overwhelming majority of chicken sold in Australia), is the most environmentally efficient, followed by pig meat and, at some considerable distance sheep meat and beef. Some summary data from the report is presented in the graphs on this page. The report itself is available here. Source: Williams, A.G., Audsley, E. and Sandars, D.L. (2006) Determining the environmental burdens and resource use in the production of agricultural and horicultural commodities. Main Report. DEFRA Research Project IS0205. Bedford: Cranfield University and DEFRA. 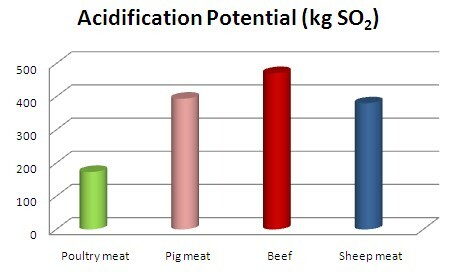 To see whether the low environmental impact of chicken meat demonstrated in overseas studies was also true here in Australia, the Australian chicken meat industry, through its national research program administered by AgriFutures Australia, funded an extensive local life cycle analysis (LCA) of chicken meat production in Australia. The report on this study, entitled “Using Life Cycle Assessment to Quantify the Environmental Impact of Chicken Meat Production” is available from AgriFutures Australia. This research, also published here, confirms the well-known, but often ignored fact that commercial chicken meat production is the most environmentally sustainable system for the production of land-based animal protein. The data generated by this study also revealed that the environmental impacts of chicken meat production in Australia are ballpark with those from studies of chicken meat production in a number of other countries when expressed on a per kg of carcass weight basis. Katajajuuri et al. (2008) – Katajajuuri, J.M., Grönroos, J. and Usva, K. (2008). Environmental impacts and related options for improving the chicken meat supply chain. In: 6th International Conference on LCA in the Agri-Food Sector. Zurich, 2008.
da Silva et al. (2008) – da Silva Júnior, V.P,, Soares, S. and de Alvarenga, R. (2008). Cradle to gate study of two differing Brazilian poultry production systems. In: 6th International Conference on LCA in the Agri-Food Sector. Zurich; 2008. Cradle to gate study of two differing Brazilian poultry production systems. In: 6th International Conference on LCA in the Agri-Food Sector. Zurich; 2008. This research also found that GHG emissions of Australian free range production systems were similar to conventional (non free range) production, which is quite different from what has been shown in some other studies of overseas chicken production supply chains, where free range was found to have a greater impact. Consistent with other studies, however (for example see here). Australian organic chicken meat production was calculated to make a greater contribution to GHG emissions and therefore global warming potential (per kg of meat produced) than non-organic production. The Australian chicken industry was one of the first Australian agricultural industries to develop an Environmental Management System (EMS) for its farmers. This was developed with funding from AgriFutures Australia and was first published in 2003, being updated and expanded in 2015. The EMS provides chicken farmers with comprehensive advice and guidance to allow them to identify and manage the environmental risks and concerns posed by their farm. EMS training packages and opportunities have been made available to chicken farmers in the adoption and implementation of EMS on their farms, to raise environmental awareness and increase the skills and knowledge of chicken farmers in environmental management. The EMS is available here. The AgriFutures Australia – Chicken Meat Program supports a number of projects aimed at assisting the industry to improve its environmental performance and to understand and better manage the industry’s impacts on the environment. See the AgriFutures website for details. Growing of chicken is less directly impacted by drought than other agricultural endeavours. However water restrictions and increased grain prices do have an impact. Grain is the major component of the feed used to raise meat chickens and its price represents a significant proportion of the industry’s input costs. Therefore an increase in the grain prices has a major impact on the industry’s costs.